The 2020 Nissan GT-R 50th Anniversary Edition keeps the car’s classic look, but is packed with new tech, including the NissanConnect infotainment system that impressed us in the revamped Micra and Qashqai. NissanConnect not only covers audio, navigation and communication, it also connects to a smartphone app that allows you to remotely lock and unlock the car’s doors, activate the alarm, contact the emergency services, and track down its whereabouts. When you’re behind the wheel, NissanConnect is controlled using an eight-inch touchscreen, which is set into a dashboard wrapped in a single, seamless piece of soft leather. Indeed, the interior is leather and Alcantara fabric as far as the eye can see, in a tasteful shade of gray that Nissan rather poetically likens to “the atmosphere of the night sky after the twilight hour”. 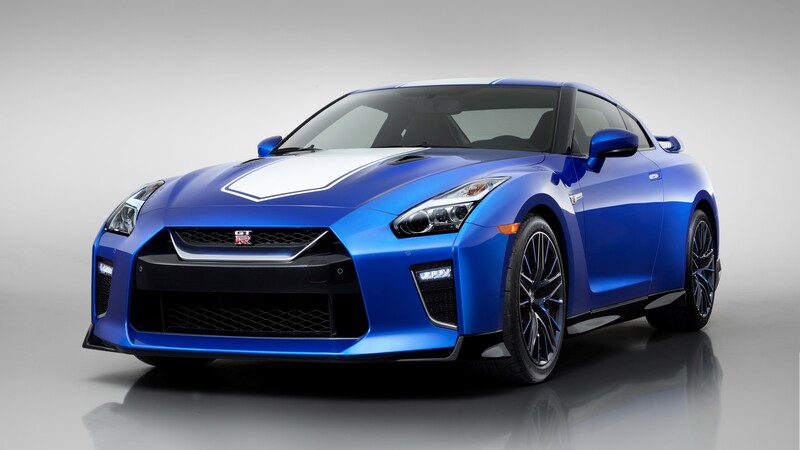 The 50th Anniversary Edition GT-R is also sportier, with upgrades including a refined ‘R’ mode designed for exiting corners more quickly on the road or on track days, plus gear shift paddles so you can keep your hands on the wheel. If you’re planning on hitting the track, you’ll also appreciate the adaptive shift control, which interprets the way you steer and accelerate and changes gear shifting modes automatically to suit your driving style without any extra input from you. If that’s not enough, Nissan is also releasing a specially 2020 Track Edition optimized for racing and decked out in carbon fiber.